The funny women of USA’s Playing House, Jessica St. Clair, Lennon Parham, and Jane Kaczmarek, were out last night for the SAG screening of their new show and chatted about everything from utilizing their remarkable improvisational skills during filming, to breast pumping while on set. And, in case you’re not familiar with our new favorite show, it’s about childhood best friends Emma and Maggie (Jessica St. Clair, Lennon Parham) who, through a series of unfortunate events, end up becoming roommates while raising Maggie’s baby together. One can imagine all the mishaps that can happen with a baby around. Kaczmarek, who’s best known for her breakout role in Malcolm in the Middle, plays St. Clair’s mother on the show, and this legend is sophisticatedly funny. Watching these mothers work together is a rare treat, especially with their unique, and shared, chemistry. During the filming of the pilot, Lennon was 8 1/2 months pregnant and St. Clair was 3 months pregnant. Talk about best friends who do everything together. We asked the moms what the transition was like coming back to work after having their babies and Lennon admitted that it was very difficult, but said she didn’t want to let BFF, Jessica, in on the challenges. “I wanted her to have her own experience,” she said. 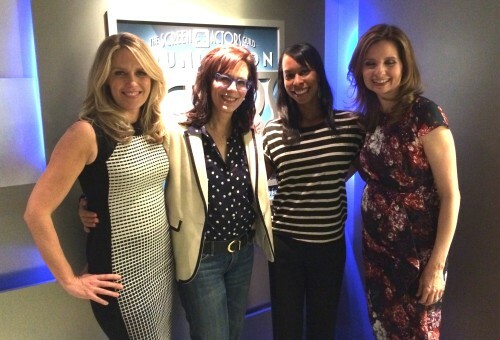 And, just in case you’re wondering what these funny ladies are like to work with, Kaczmarek let us in on the scoop. Not only did she say that it was great having such remarkable female bosses, but the mommies make sure to wrap by 6:30 so they can get home to feed their babies and be with their families. Sounds like a fun place to work! Playing House can be seen Tuesdays on USA Network.